The neck supports the weight of the head and protects the nerves that run from the brain. This section has seven vertebral bones that get smaller as they get closer to the base of the skull. Neck pain is typically muscle related and is often caused by an injury or accident. The problem is if neck pain lasts longer than two weeks to three months. If numbness or tingling is radiating down the shoulders and/or arms, a pinched nerve could be to blame. If the pain feels sharp, it may be related to degenerative issues, a herniated disc or a muscle strain. Pain in the thoracic region affects the mid-back. 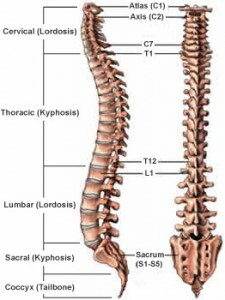 There are twelve bones that make up this section with the rib cage attached at each level of the spine. This provides stability and support to the upper back that is designed to protect vital organs. Pain can be caused by several factors. Muscle strain, ruptured and herniated discs and a fracture in the thoracic vertebrae are all possibilities. Although pain experienced in this region can be severe, it may be treated non-surgically. A customized treatment plan, again involving physical therapy and medication, can mitigate painful symptoms. The lower back has more motion than the upper back and carries the weight of the torso. For this reason it is more prone to injury. The lumbar spine has five motion segments. Most of the motion in the lumbar spine is at L3-L4 and L4-L5, so these segments are the most likely to breakdown from wear and tear. The two lowest discs (L4-L5 and L5-S1) take the most strain, thus are the most likely to herniate. Lower back pain can be caused by muscle strain, degenerative factors, herniated discs, fracture or arthritis. If the pain radiates from the thigh, it could be the result of nerve damage from a herniated disc or sciatica. In some cases, this pain can be treated with surgery, but in many cases, it’s treated with a combination of physical therapy and medication.